In 1977, Kurt Rumens first began selling stoves to supplement his income as a rock musician. Soon, some retailers started suggesting product improvements so he drafted sketches incorporating his best ideas and submitted them back to his manufacturer. He quickly received a terse letter telling him to stick to selling and not product development; but recognizing the importance of aesthetics and efficiency in hearth design, he used the feedback as the foundation for his own hearth-products company. So in 1979, he created what is now known as Lopi. The next year, Lopi pioneered the now standardized use of clear ceramic glass and a pre-heated air wash system within wood stoves to keep the fireviewing area clean. 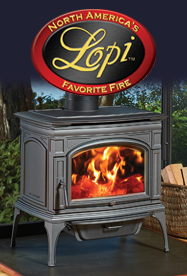 In 1984, Lopi became the first U.S. hearth products manufacturer to develop an EPA-certified, non-catalytic wood stove. Today, Lopi is the brand now known for its American classic style of innovation into its high-performance wood, gas and pellet burning stoves, fireplaces and inserts. Find out more about our Lopi products here. In 1992, Travis Industries acquired Fireplace Xtrordinair, a brand that quickly emerged as the elite line of gas fireplaces and inserts. 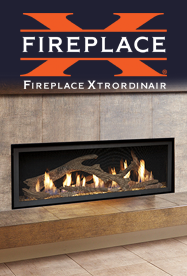 Today, Fireplace Xtrordinair is now referred to as FireplaceX and is well known for their premium quality gas fireplaces, gas inserts, wood fireplaces and wood inserts that offer a wide variety of custom-crafted styles with unique detailing. With a reputation for innovative design, excellent craftsmanship and energy efficiency, more than a million customers have chosen FireplaceX for their homes across North America. Find out more about our FireplaceX products here. 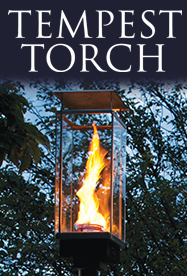 In 2007, the Tempest Torch line of gas torches is launched and awarded the Best-in-Show Vesta Award honoring design, innovation and technology within the Hearth, Patio and Barbeque Industry. The Tempest Torch breaks the barriers of standard torch design, featuring a spinning, spiral-like flame for a dramatic presentation of dancing fire. With the Tempest Torch, the display possibilities are nearly endless, as it can be featured virtually anywhere outside, from decks, patios, walkways, entertainment spaces, pools, businesses or storefronts, and even on exterior walls. Find out more about our Tempest Torch products here. 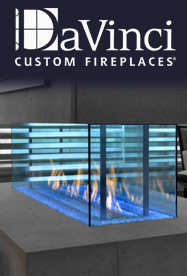 In 2014, DaVinci Custom Fireplaces was introduced as a new brand in the House of Fire lineup. The DaVinci brand was quickly recognized as the most unique and innovative custom fireplaces ever made, winning the coveted Vesta Award for Best New Gas Fireplace at the 2014 HPBExpo. These custom, made-to-order fireplaces solve all building and installation inefficiencies and offer the very best of design, innovation and functionality in the custom fireplace world. With DaVinci, there are no design limitations. Find out more about DaVinci Custom Fireplaces here.